Free Virus Removal Software is attractive during times of economic hardship. Are free programs usually any good? In my experience the answer is usually no. However, there are some very good free virus removal programs out there, if you know where to look! DO NOT underestimate the importance of having anti virus software installed on your computer! Computer viruses are on the rise. Therefore, so is the risk to your home computers. If you can't afford to buy anti-virus software, then you should at least have a Free Virus Removal Software program installed on your computer. Part 2 Free Computer Virus Scan looks at some of the virus removal tools that lots of anti virus companies provide for free. These stealth tools help remove stubborn viruses. Once you have read through part 2 you will know how to find and use the different types of tools available. Do you use Free Anti-virus software on your home computer? Which one do you use, and why did you decide on that particular program? Write your own personal web page by filling in the What Is Your Free Anti Virus Program? Form at the bottom of this page. Click Here to read other visitors web pages. In my opinion the recommended hardware specification here is too low. A computer with this specification would grind to a halt with any anti virus software running on it. Fortunately most home computers will cope with this software without issue, including the 2014 version. One of the good things about this particular free virus removal software is that it creates a System Restore Point before installing, and completes a quick scan of your computer after installing. Avast! takes up about 27MB RAM to monitor your computer, and pro-actively picks up threats in real time. To continue with the free version you need to register with Avast within 30 days of installation. I do not think this is an problem considering what you get with this software. Avast! Is considered one of the best free virus removal software programs available today. Overall. I think this is an excellent program. For a first time home computer user the program may be a little complicated to use. However, this is easily fixed with a little perseverance. AVG Anti-Virus FREE is also a very popular free virus removal software program for virus protection. Features include. In my opinion these specifications are a minimum. If your computer hardware is borderline, give AVG a go anyway. If it slows things down too much, remove and install another program - trial and error! AVG is a popular and effective program for most home computer users. It only uses around 29MB RAM in protection mode. I used AVG for years. There is a slight delay between newly discovered viruses and the signature file update being released to protect against these new viruses. If your web surfing habits are sensible this does not usually pose a big risk for most home computer users. I think this product is an excellent free virus removal software program, as does millions of others. Take a look at the Free AVG Antivirus Download tutorial for more details on this software. 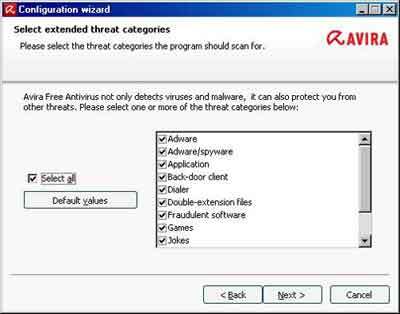 Avira Free Antivirus is another good free virus removal program. In addition to virus protection it includes protection to most forms of Malware and other threats. The installation process for 2014/15 is very different to a couple of years ago. Today you are automatically taken to a My Avira Dashboard to register devices such as Smartphones and monitor your installation process. Once installation and configuration are completed the Avira status confirms your device is now protected. As installation does not give you the option to configure your settings, you need to do this by accessing the applications as directed above. For example, your choice of Threat categories are not presented as part of the installation process today as in 2012. Depending on your circumstances an all-in-one protection program could be the way forward for you. However I prefer a dedicated malware removal tool, such as the Malwarebytes Anti Malware Program, in addition to a dedicated anti virus removal tool. The download file is approximately 143MB in size today, compared with 85MB 2 years ago. Heuristic scanning level is set by default to Medium Detection Levels. The higher the level the more chance there is of legitimate software being falsely diagnosed as a virus. I usually keep it at the default setting. This free virus removal software program used 36MB RAM for proactive monitoring, up 30MB from 2012. This is not an issue on new machines. The 2015 issue also address one of my 2012 concerns about scanning boot files. These are files that load into memory when your computer is starting up. They need protecting too and today they get that. Certain Viruses can plant themselves into this process and cause their damage before you can even interact with your computer. The program is clear and easy to use. This is a good thing if you are unfamiliar with using antivirus software. I also tested real time monitoring and found it picks up potential viruses instantly. It also gives you the choice on what to do if the program is unable remove the infection from your computer straight away. Microsoft Security Essentials has its own dedicated 2-part tutorial series. This is because I use this free virus removal software on my home computers. I acknowledge there are potentially better free virus removal software programs available, but this program works fine for me in my circumstances. Part 2 Microsoft Virus Protection looks at how to use the software to get the best out of it. This free virus removal software program proclaims that all the work is done in the cloud (online). At less than 1.5MB RAM monitoring requirements on Windows 8, this is the lowest resource requirement of all the programs we are looking at. The new style dashboard view in the 2014 edition displays the current real-time state of your machine. 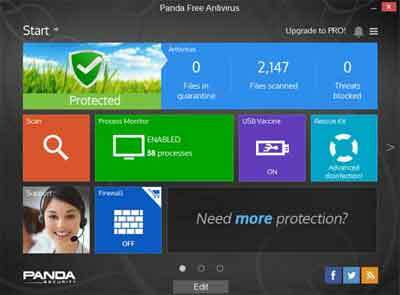 Panda's proactive monitoring clears out viruses and let you know by popping up a message on screen. "I think more details would be helpful e.g. what the infection is called and where it was located on your computer." In 2015 the same test on Panda Antivirus displays some of this essential information. To see the type of virus Panda detected, open the quarantine report. From my own thorough lab testing that I am impressed with Panda's efficiency, proactive virus detection and removal, simplicity of use, and small footprint (Industry talk for low hardware requirements). The Open Source Community developed this free virus removal software which is used by over 600,000 people worldwide. Programmers from around the world develop such software free of charge, in their own time. This is because they believe commercial products are usually flawed and cost everyday home computer users too much. 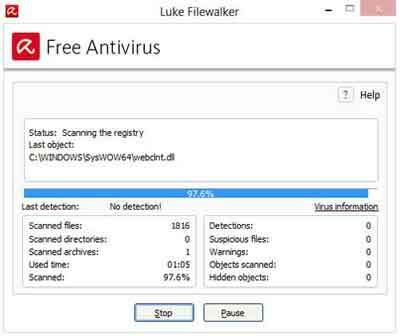 The main issue I have with this Free Virus Removal Software program is it does not include a real-time access scanner. You need to run a manual scan or setup a schedule to scan your computer on a regular basis. The free virus scan download file size is about 100MB at the time of writing. Personally I think this free virus removal software program has a lot of potential, but needs a bit more work before it can rival the other software we have looked at. In my lab environment I confirmed a manual scan found the test virus I planted on the desktop. There is a little known technique to test that your Anti virus software is working as expected. The European Institute for Computer Antivirus Research developed the EICAR Standard Anti-Virus Test File for Companies and Programmers to test their programs without using a real Computer Virus. 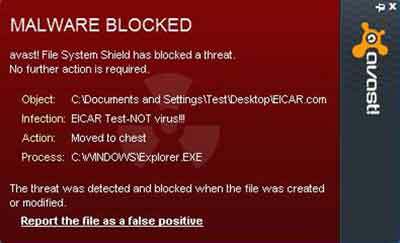 EICAR is a non-viral string of code that most anti virus software companies include in their signature definition files. Real-Time protection programs should pick this file up straight away and deal with it accordingly. For more information so you can make an informed choice, take a look at the Wikipedia List Of Antivirus Software (Opens New Window). According to this list the two best Free Virus Removal Software programs are Avast! and Panda Cloud. I agree with this conclusion after my lab testing exercise. However, other programs such as Bitdefender Antivirus Free Edition are gaining in popularity and should not be discounted. If I were to recommend one for your home computer(s) I would go with Panda. Despite the name it is excellent at it's job for a free anrivirus solution. It is also easier to use if you are new to Anti virus programs. It is up to you which anti-virus program you use. I hope my guide helps you make the right choice. I hope you found this tutorial useful. Now it is time to take a look at Part 2: Free Computer Virus Scan. What Is Your Free Anti Virus Program? Do you use a Free Anti-virus program on your home computer? What is the program called? Why did you decide on that particular program? Enter Your Title e.g. "I Use AVG Virus Software"